Agromeck Co-Photo Editor, Ryan Parry said: This week’s photo of the week is from staff photographer Kamakshi Arora. Kamakshi is a newer photographer that took on a difficult assignment in the Double Barrel Benefit. She did a great job though, coming back with this photo of the lead singer of Lonnie Walker performing. The emotion on his face as he sings makes this picture a step above the rest. Her lighting was done well and the photo is sharp as it should be. Overall, this photo is a great show of her photographic abilities. Agromeck Co-Photo Editor, Ryan Parry said: This week’s photo of the week is from staff photographer Nick Faulkner. Nick shot the gymnastics meet against North Carolina and took a different approach for regular action photos. 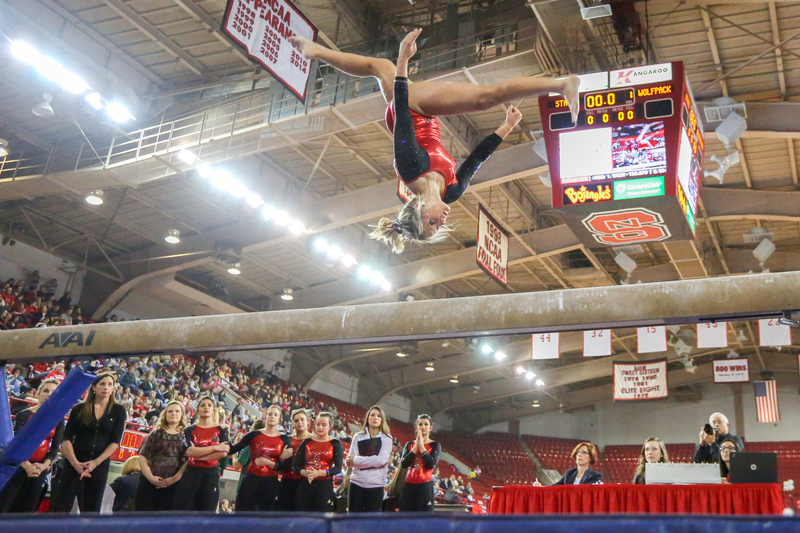 In this photo, Nick got low and caught Courtney Bisbe as she’s flipping while on beam. The low angle shows a new perspective for this shot and takes in the atmosphere of Reynolds Coliseum.